These light meringues are topped with a lightly sweetened yogurt sauce, pomegranates and pistachios. Perfect for the holidays! Thank you to QSquared NYC for helping me to share this recipe with you. As a kid, I used to love my grandmum’s meringue cookies. I would sit on the tall stool in her kitchen, watching her dollop the sweetened whipped egg whites onto baking sheets as I munched on crispy Bugles and dry-roasted peanuts, the snacks I got to eat only my grandparents’ house. Using her fingers, Grandmum would then poke chocolate chips or pieces of crystallized ginger into the pillowy unbaked meringues before sliding them into the oven. While they baked in the just-warm oven for a couple of hours, I filled my time by categorizing my dad’s old marble collection (sparkly ones, colored ones and so on) or banging out Sound of Music songs on the old piano in the basement, checking back for a meringue status report every several minutes. “Not yet, dear. You have a little while longer to wait,” Grandmum would patiently tell me. In the impatient mind of a young girl, the waiting felt torturous. Then came the call from the kitchen. I ran up the basement stairs, tripping over my own feet in my haste. I started with one of each…one chocolate meringue and one ginger meringue. It had to be even. They were both equally good and I couldn’t play favorites. My teeth broke through the crispy outside crust into the tender meringue and chocolate or ginger inside. They were heavenly little treats. Even though the taste will always stay with me, perhaps what is more important is that I feel Grandmum’s warmth and sparkle each time I make meringues for my own kids. I was inspired by the colors of the holiday season when I saw pomegranate arils in the grocery store. (If you have a whole pomegranate, How to: Seed a Pomegranate will help you get out those arils easily.) The red pomegranate and beautiful green of chopped pistachios seem to be nature’s way of celebrating the holidays. Natural and beautiful. The meringues are served on some of my favorite serving dishes, made by QSquared NYC (you may remember seeing some of their beautiful dishes when I made this butternut squash salad and these healthy pizza crostini). The serving platter (and all of the awesome giveaway items below) is from their Diamond collection and the small plates are from their Ruffle collection. I know several of my friends and family who would love to receive some of QSquared NYC’s dishes for holiday gifts! 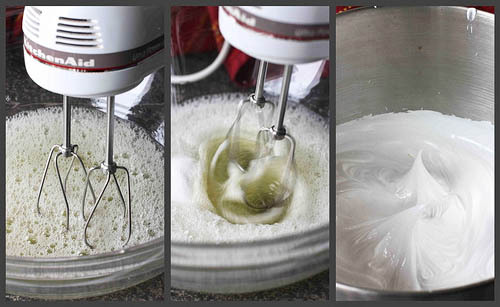 Be sure that the mixer bowl and whisk attachment (or bowl and hand-held mixer) are clean and completely dry. The egg whites need to be whipped until they form stiff peaks. This means that when you pull the mixer/whisk attachment out of the mixture, the egg whites form peaks that do not flop over at the top. Even though the prep time may seem long for the meringues, most of it is inactive. They bake for 1 hour in a warm oven and then rest in the oven (turned off) for 1 1/2 hours. If you’d like your meringues to look a little fancier, use an icing piping bag and tip, like I show in How to: Make Meringue Shells. Light and easy! These are wonderful for the holidays. Place the egg whites and cream of tartar in the bowl of a mixer fitted with the whisk attachment (or in a bowl with a hand mixer). Mix on high until the egg whites are foamy. Continue to mix on high speed while gradually adding the sugar. Whip until the egg whites form stiff peaks. Do not underbeat. Line two baking sheets with parchment paper. Using a 3-inch circular cookie cutter (or edge of a glass), trace 12 circles onto the parchment paper. Turn over the parchment paper so that the pencil marks are on the underside of the paper. They should still be visible from the top side. Divide the egg white mixture evenly between the 12 circles, using the back of a small spoon to make a shallow well in the middle of each circle. Bake for 1 hour, then turn off the oven and leave the meringues in the oven for an additional 1 ½ hours so that the meringues dry completely. Gently peel the meringues off of the parchment. Cool completely. Set aside 6 meringues for this dessert and freeze the remaining 6 meringues in an air-tight container for future use. In a medium bowl, whisk together the yogurt and agave nectar (or honey) until combined. Divide the mixture evenly between the meringues. 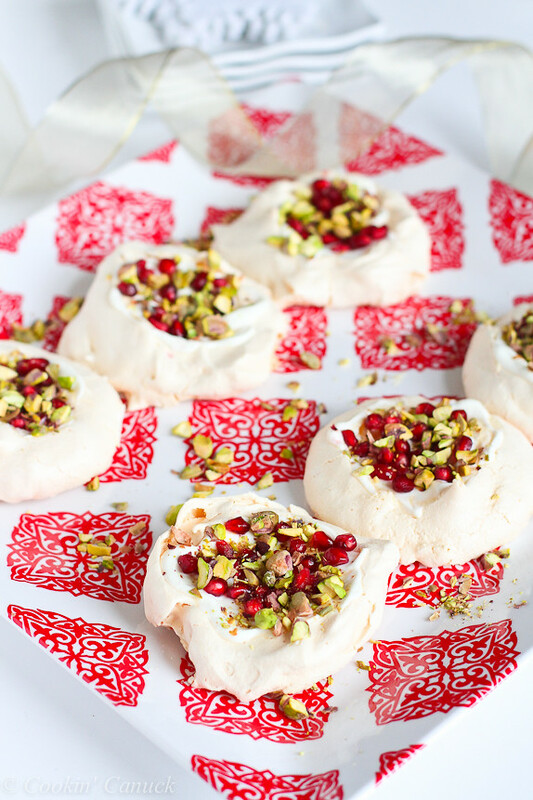 Top each filled meringue with pomegranate arils and pistachios. Serve. We moved to a new home so we’ll be having friend’s over to see it! It’ll be just us four this holiday, and I wouldn’t have it any other way! These look so vibrant and beautiful! And I love the flavor combo you used! I’m not planning on having a big party but my husband and I love inviting our single friends over for a home cooked meal. These look so good! I’ve always wanted to make meringues! Dara these meringues are perfect for holiday entertaining! Can you believe I have never made meringues before?!! These are so lovely!! love the pomegranate arils and pistachios! so beautiful! Those meringues are so pretty! And I like that the recipe makes extra meringues for freezing. I’m definitely entering this giveaway. Those dishes would be perfect for entertaining. What a lovely story, Dara. And gorgeous meringues! My kitchen color is red, so these are so perfect!! looks great. I can’t wait to try. Those look delicious! I love the idea of topping meringues with pomegranate seeds. Such pretty dishes! My friend would love those! These meringues – AND the dishes – are so pretty and festive! I always make gifts with my grandchildren (4 year old granddaughter 4 & 6 year old grandsons) to give their parents for Christmas. My mother made meringues with me and I look forward to making these with my grandchildren to give to their parents for Christmas I know they will not last until Christmas but it is the thought that counts right……. These meringues are beautiful in every way, Dara. Both festive and healthy, and the story about your Grandmum is just priceless. Your story is heartwarming and reminds me of the time I spent cooking with my grandmother. My mother always made meringues for Christmas; yours look so awesome and sound so yummy! Thank you for this generous opportunity!! Two of my favorite things!! Love the pom and pistachio, not something I’ve put together before, but it’s perfect! My daughter makes meringues often, this will be our next version. Pinned! Those are so beautiful, love that you added poms and pistachios! I love meringues. I love pistachios. I love pomegranates — so I’m thinking this will be a new love!!! I love meringues!! Thanks for the great giveaway! These look amazing. I never would have thought to pair pomegranate & pistachio with meringue! I love these dishes. My kitchen is red and white and these would look so nice. A nice giveaway and thanks for the chance to win. I will be having a couple of my friends over for dinner in my new rental…. in a new town and will use this lovely gift if I win!! Grandma’s cookie at my house too! This is so different I just have to try it! We need more lighter recipes like those meringues at this time of year when everything seems to be fat laden and heavy. Thank you for sharing a guilt free sweet! Hi Dana! I love meringues, too, as they are a staple in Scotland! haha! Seriously, I still love them as much as I did as a little girl. I would love your recipe as is, however, my daughter is seriously allergic to tree nuts, so I would never be able to make them with the pistachios with her here, but I could if I used my oat brittle instead! Thanks for the great recipe! This is a beautiful recipe! It would be so festive for the Holidays. 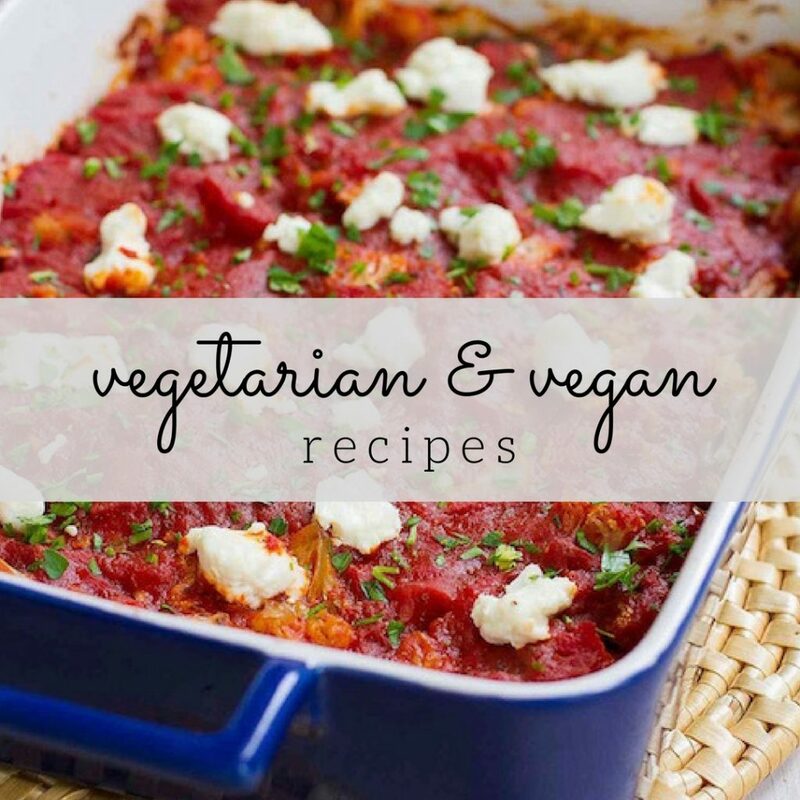 Cannot wait to try the recipe and LOVE those dishes! What a wonderful memory of time spent with your grandma and a sweet treat. They look even prettier on the pretty plate. I love meringues and these look delicious! These are just gorgeous, Dara! I absolutely adore meringues – they’re just so beautiful and dreamy! Your pomegrante-pistachio combination is stunning for the holidays! I love love love these dishes! So beautiful! It’s been years since I’ve made meringues, but now you’ve got me thinking it’s time to crack some eggs! 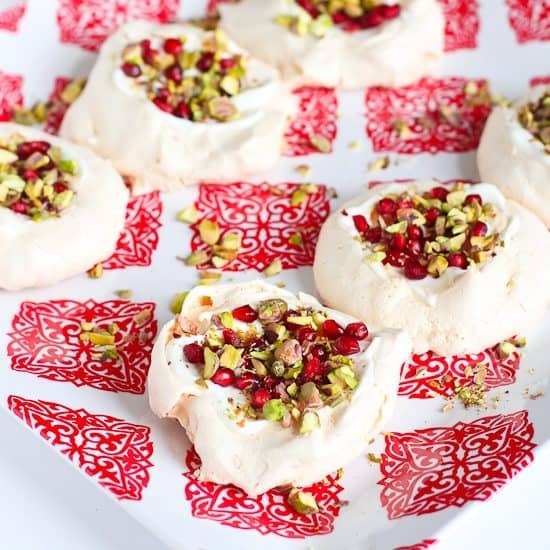 Your pomegranate and pistachio filling is beautiful in the lovely white meringues. Thanks for sharing your recipe. What a beautiful dessert! I’m always looking for sweet endings to meals that are calorie conscious – this recipe fits the bill and looks festive for the holiday season! Thanks for sharing it! I have made meringue for pies before and always thought it was hard but after reading this I have realized my mistakes and this recipe looks amazing I will be making this one soon! 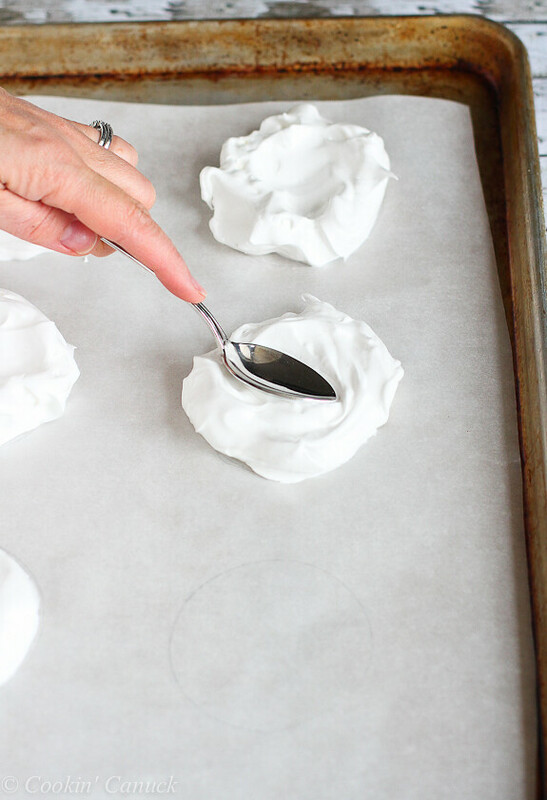 I like making meringues on occasion and this adds such a fun, festive twist. I think I’ll have to try them this holiday season! Thanks for the recipe and the beautiful giveaway. this looks like the perfect addition to a christmas potluck! These look so colorful and delicious!! OMGosh Dara – I love love love the ingredients in this. It looks amazing, and I can imagine eating a dozen or more. This, my sistah, is so pinned so that I don’t forget to make it! Low calorie, sparkling with festive holiday colours, and a make-ahead base…sounds like a super holiday treat. 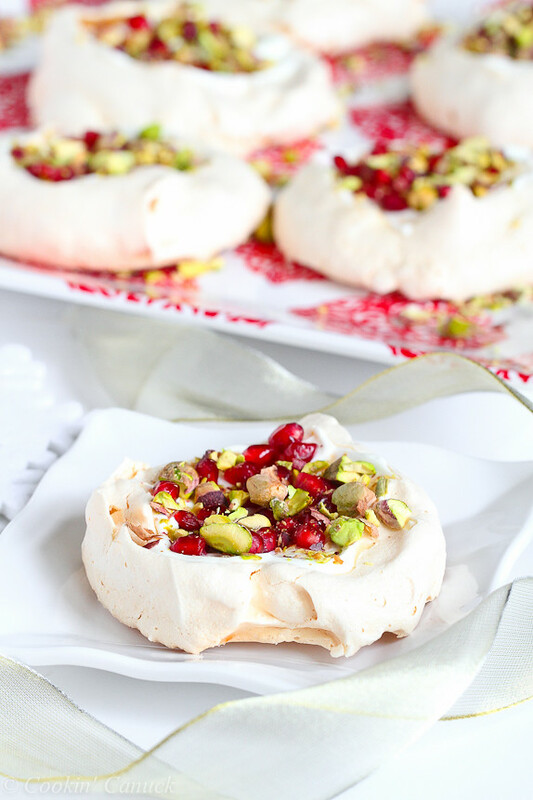 Everyone in my family loves meringues…so this is inspiring me to make them with your gorgeous pomegranate-pistachio idea! So festive for the holidays! These look so pretty, I now have a reason to buy a hand mixer! I adore this post. My grandmom died when I was little but I have such vivid memories of my grandpop, coming over every Sunday after church to make homemade cheesesteaks and French fries with me and my brother. Food memories truly are the best. I think we’ll have to make some of our own with these meringues. They look like little pillows of heaven! I absolutely love the memories you have with your grandmother and making the meringues. Yours are beautiful and I love the pistachios and pomegranate topping. So incredible festive and elegant. Plus those dishes are gorgeous! You have me craving meringue. These are absolutely stunning. Pinned. Oooh, they’re like Pavlovas, but better. There’s nothing like whipping up egg whites to those luscious, glossy peaks! These are so pretty! I don’t think I’ve ever had a homemade meringue before. It’s so much fun to think about things that remind us of our grandmas. The things they made us. I love & miss all the little treats that my grandma made me. I really enjoyed this story 🙂 I’m sure I’ll enjoy the meringues just as much! Just the three of us for the holiday. Nice and cozy. Dara, besides being gorgeous, these sound like a taste (and texture) sensation! And I’m always a sucker for a grandmother story! These are so festive and pretty and I love that you filled the meringues with greek yogurt! These are truly gorgeous. I cannot get over how pretty they are. I saw them on pinterest and was in complete awe. I have never made a meringue before, it has always seemed hard to master, I absolutely found this recipe helpful! I feel with your tips and added detail, I could be confident in serving a lovely dish. The tip on whipping the egg whites, I found most important, as I am likely to forget that detail. Very helpful! I love that you used pomegranate arils and chopped pistachios to add beauty and festivity to this lovely holiday dish. Very eye appealing! 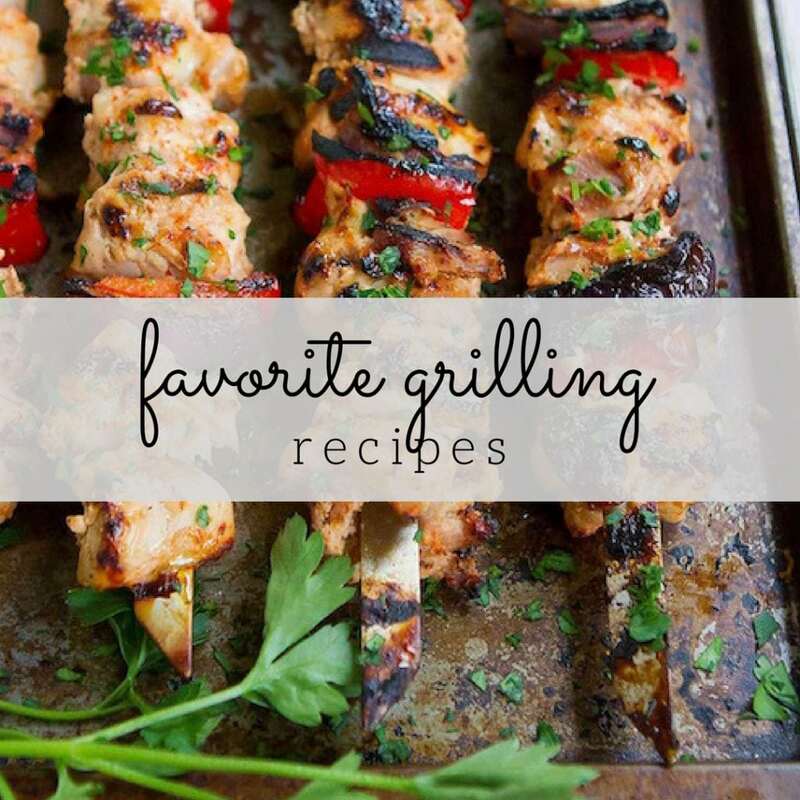 Really love these dishes and the recipe. Thanks for the giveaway. These meringues are so festive! Love’em! The patience of a child is always tested with baking. What a great memory and a wonderful recipe! I can’t wait to make these!!! I’ve never made meringues, but I love to eat them! These look like something I can make thanks to your instructions. I try to avoid having breakable things in the house with a toddler around, but these would be super pretty for dinner guests! What a very interesting recipe! I love how you included tricks in your post, very helpful! Oh wow, these look very interesting and yummy. I might have to try just to see. I have never had anything like these. I would love to try them. I would have never thought to pair pomegranate & pistachios. Festive holiday colors! these are so pretty..I have never had Merinque cookies…thanks, for the recipe..I will try it. OK….my mouth is watering..These look amazing. Such lovely meringues, all I can say is yum. I would love to try this receipe mostly because I absolutely LOVE both Pomegranate & Pistachios. So, I am sure I would love this too. Thanks for sharing it. I attempted to make meringues for a tree stump cake once. They didn’t turn out to great but yours look yummy! Love the design and colors of the dishes! Would love to try the dessert but I have to talk my husband into a stand mixer for Christmas. I love those dishes!! I can’t wait to they these meringues! 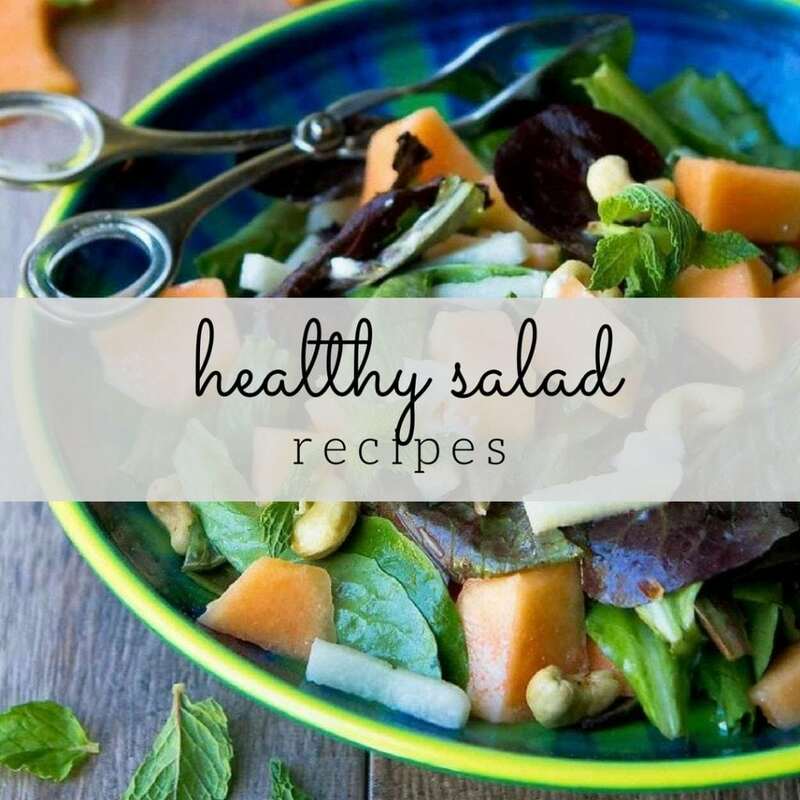 You recipes are always so gorgeous! These are going on my holiday must-try list! I’ve never made meringues, or even tasted them, but your beautiful recipe makes me want to try them. They look delicious and so easy to create. Love these dishes! Clean and modern, and perfect for many occasions! The Dishes are Beautiful and I have always wanted to know how to make meringue! I’d love to use this recipe for my next dinner party. These look heavenly and I am all about meringue right now! Meringues were my favorites as a child, I could just inhale them. Haven’t had any in years, but I think I have to make some very soon to let my own kids have a taste! This recipe looks so easy to follow!!!! Not to mention so yummy. I want to try it! These dishes are super cute!! I am totally diggin’ them!